The love that left me – HubNut – celebrating the average! Some years ago, I had more money than sense. Now I have little of either. Back then, I worked in IT Support for a large utility company, enjoying the highest earnings of my life up to that point. Then I turned 25. I decided to celebrate this momentous occasion by hiring an MG RV8 for a day. We clocked up 200 miles hurtling around The Cotswolds, enjoying the acceleration and wonderful noise as we exited every village. Other than the engine, the RV8 was nothing short of a massive disappointment. The interior was a horrible mix of controls pinched from such wonderful machines as the Rover 100 and LDV Pilot, the suspension seemed to have been forgotten completely and bends became terrifying as it skitted about like a tea tray skidding down a cobbled street. I digress. Ah, the car that broke my heart. What a machine! It was my first encounter with Rover’s V8 and it was soon clear that like an addict, I needed another hit. The choice of what to go for was enormous. The engine has been fitted to so many cars. Here’s a few for you. Rover P5, P6, SD1, Land Rover, Range Rover, Land Rover Discovery, Land Rover Forward Control 101″, Ginetta G32, TVR 350, Griffith and Chimaera, Freight-Rover van, MGB, MG RV8, Triumph TR8, Marcos (various), Morgan Plus 8 and even, in Australia, the Leyland Terrier truck. It’s a bit of a whore is that engine. 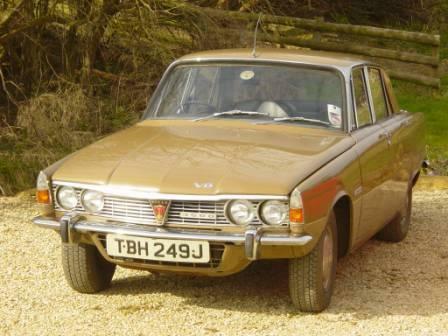 I rushed out and found a Rover 3500 for sale, more commonly known as the Rover P6B. It was a car I’d long had a hankering for. It mixes British engineering, but with a large dose of Gallic flare – for the base unit construction is very similar to the Citroen DS, the big giveaway being the similar treatment at the top of the windscreen. So won over was I by the wuffle of that V8 (the Rover P6 DID get the engine it deserved, unlike the Citroen), the stunning Tobacco Leaf paintwork and the fact that it was a rare pre-facelift model. I ignored the rotten sills as a mere technicality. Driving home in my new machine was certainly quite an experience. It was the oldest car I’d ever owned and driven up to that point. It didn’t have power steering, but that seemed no great loss as the large wheel seemed to do a pretty good job of making the thing go where I wanted it to. It was also my first automatic though, and while I had driven autos before, the old Borg Warner 35 gearbox used in the P6 is a clunky old devil and it took time to work out how to get the best out of it. The brakes were superb though – all-round discs were standard on the P6 even from launch in 1963. I think I’d utterly fallen under its spell by the time I got back home. The cosseting ride and surprisingly nimble handling just left me to savour that V8 as it effortlessly bore me along. I did discover that the kickdown didn’t work, but that would probably end up saving me a small fortune. With so much torque on offer, who needed it? I could always snick the gearlever down into 2 if I fancied a bit of full-blooded acceleration, with the V8 screaming magnificently. It turned out I did fancy this, quite often! Especially as I accelerated out of Lower Boddington in Northamptonshire. I apologise to the residents. Not my neighbour at the time though, he loved it! I can’t imagine there were many IT professionals (I use the term very loosely in my case…) who were sauntering around in a 24-year old, petrol-slurping executive car, but I was, and I loved it. Sadly, I was becoming aware that the sills were going to need attention before too long. The car went off for some expensive surgery. The bill for £1400 almost floored me, but around this time, I got a job that paid almost twice as well, so all was well. Wasn’t it? Not really. Despite a wonderful random trip to Wales just after Christmas (not very far from where we live now, and we passed through our current village!) there was no denying that 20mpg was getting a bit tiring, despite my new income. Maintenance bills were making me weep too. Keeping a P6 in fine fettle gets very painful very quickly if you can’t do the work yourself, and I couldn’t then. In the end, I sold her on Ebay for a few hundred pounds less than I paid for her, after throwing a LOT of money at her in the time I owned her. 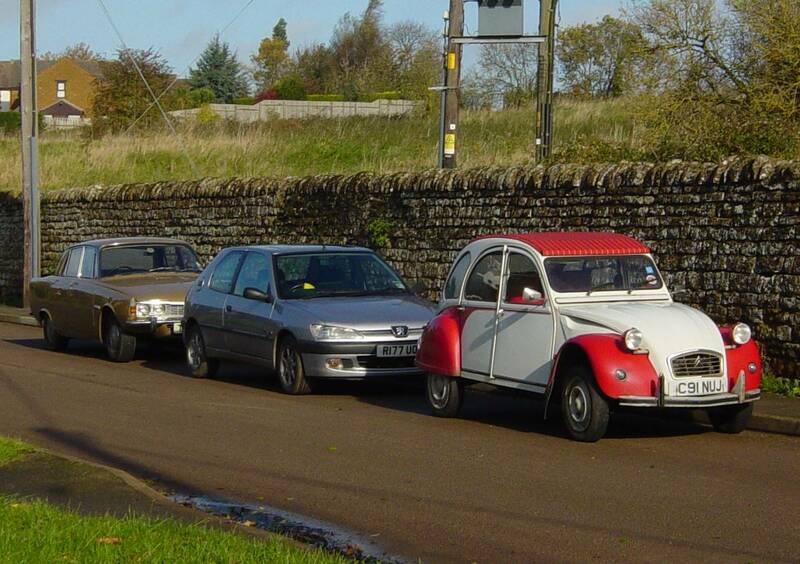 I can think of a few recipients for the Rover V8 you haven’t mentioned…you’re forgetting the Sisu Nasu for a start!